Product #16605 | SKU M2A03L | 0.0 (no ratings yet) Thanks for your rating! 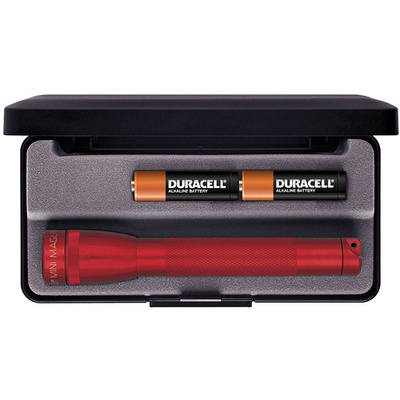 The Mini Maglite 2-Cell AA Flashlight with Presentation Box (Red) from Maglite has a compact and durable design made in the USA. The Mini Maglite features a bright spot to flood adjustable beam, and is powered by 2 AA batteries that last up to 5 hours. Constructed out of an anodized aluminum alloy, the Mini Maglite is corrosion resistant, impact resistant, and weather resistant. This flashlight comes with a presentation box to protect it when not in use, and serves as the perfect way to present the gift of illumination.